Sylvia Woods outside her eponymous Harlem eatery. Photo from people.com. HEAD’S UP: Filmmaker Byron Hurt shot part of his new award-winning documentary, “Soul Food Junkies,” at Sylvia’s Restaurant. He generously agreed to share some of his thoughts, first published at CNN.com, about what Sylvia Woods represented for him. The cultural icon died on 19 July at the age of 86. I knew right away which Sylvia she was referring to. Something must have happened to Miss Sylvia Woods, the pioneering restaurateur whose soul food gave comfort to so many people. As I thought about the social and historical significance of this great lady, what struck me was that my friend didn’t refer to her as "Ms. Woods" or "Sylvia Woods." She simply said "Sylvia." It was as if she were informing me that a family member or a close personal friend had just passed. Though Sylvia Woods was not a blood relative, she felt like one to me, and to anyone who frequented her world famous Harlem eatery, Sylvia’s Restaurant. It was a place where you were home. You could let your guard down, relax and dig in. In her restaurant, hang pictures showing Sylvia smiling next to wealthy entertainers, powerful politicians, foreign dignitaries and famous athletes. The photos are a testament to her array of fans across racial and cultural lines. 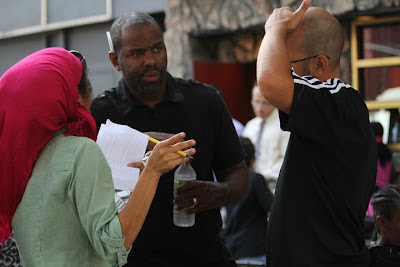 Director Byron Hurt (center) at Sylvia's Restaurant during the filming of "Soul Food Junkies." Photo from "Soul Food Junkies" Facebook page. 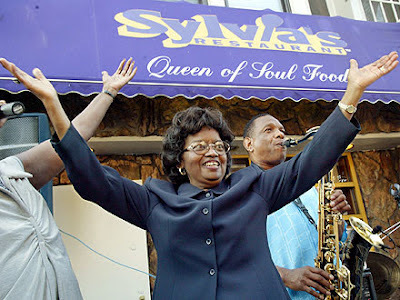 At Sylvia’s, I felt a sense of belonging – and racial pride – in dining at an established cultural institution famously built by a woman who had the vision and courage to create an empire by cooking smothered chicken, barbecue ribs, oxtails, potato salad, catfish fritters, black-eyed peas, collard greens and a host of soul food dishes. Many African-Americans have grown up and grown old eating soul food. 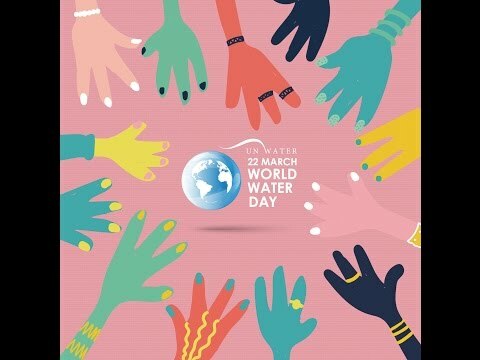 It has been an integral part of our journey here in the United States of America. During the Great Migration black people like Sylvia Woods, who hails from South Carolina, brought Southern cooking to cities like Chicago, Newark and New York City. By the late 1960s, black Southern food was coined soul food and filled the empty stomachs of Black Power and Civil Rights activists. Cultural ties to soul food extend back to West Africa. Enslaved Africans who survived the Middle Passage brought memories of the food and cooking techniques that blacks still practice today. The food that was planted, grown, raised, prepared and cooked by the hands of enslaved Africans in the South was food that over time became a common staple on Southern tables during slavery and Reconstruction. Though soul food is linked to disproportionately high rates of blood-sugar imbalances, hypertension, diabetes and heart disease in blacks, many are reluctant to give it up because it has been part of their family history for generations. Many blacks view this uniquely black cuisine as a source of honor because it helped them survive difficult times and helped to shaped black culture. 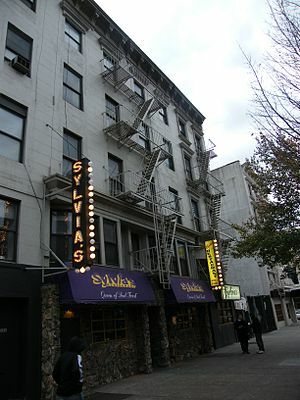 Harlem landmark Sylvia's Restaurant has served big shots and little people for 50 years. Photo from Wikipedia. Soul food is a huge part of my cultural identity and history, too. For the 17-hour car rides from New York to Georgia that my family took when I was growing up, brown paper bag meals often consisted of foil-wrapped fried chicken, homemade sandwiches and slices of cake. Soul food was on the menu at church picnics, family reunions, as well as Thanksgiving and Christmas dinners – even at the repast after funerals. So whenever I walked into Sylvia’s more than three decades of wonderful memories of eating food – prepared by loving hands – walked in with me. Sylvia Woods will be memorialized today at a ceremony at the Grace Baptist Church (http://www.gracebapt.org/home.html). A viewing is scheduled from 10 a.m. to 11 a.m., followed by a service at 11 a.m. The Rev. Al Sharpton will deliver the eulogy. She was also remembered yesterday at a wake at the Abyssinian Baptist Church (http://www.abyssinian.org/).